Jaewoong Sim Alaa R. Alameldeen Zeshan Chishti Chris Wilkerson Hyesoon Kim MICRO-47 | December 2014. 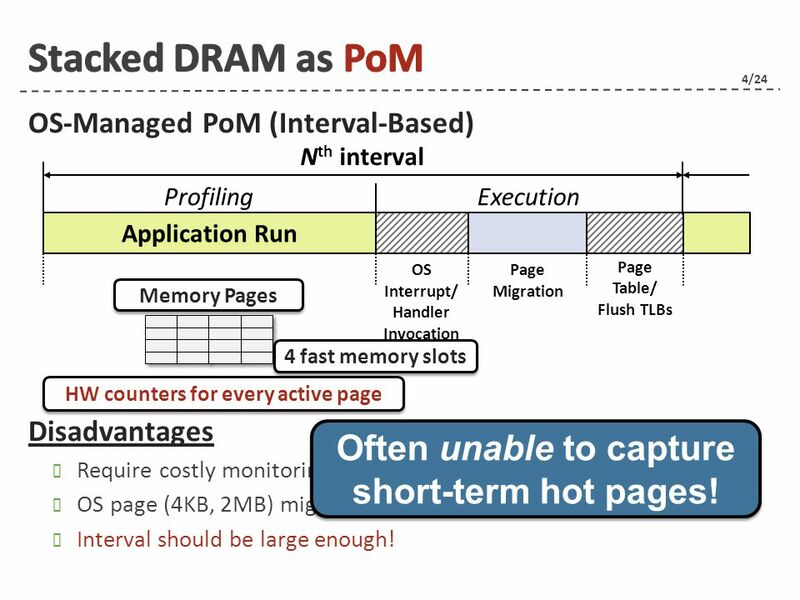 2 2/24 Stacked DRAMDRAM CacheFAST Memory Die-stacking is happening NOW! 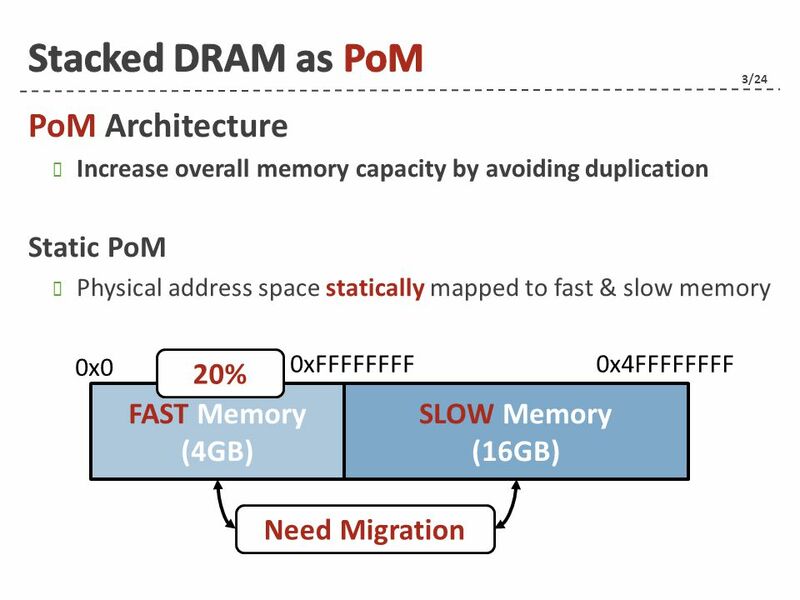 Use as a large cache (DRAM$) Use as part of memory (PoM) CPU Off-Chip Memory Data Duplication  SLOW Memory JEDEC: HBM & Wide I/O2 Standards Micron: Hybrid Memory Cube (HMC) Single Flat Address Space! 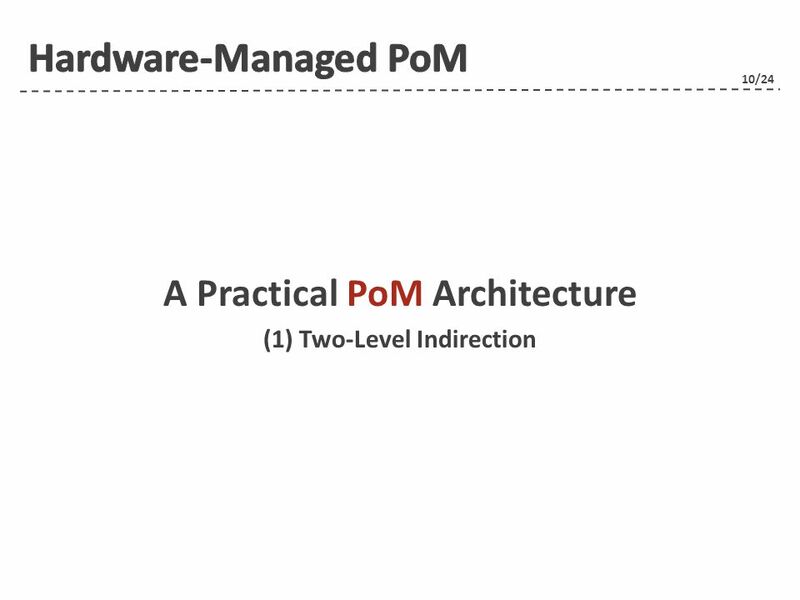 Q: How to design PoM architecture? 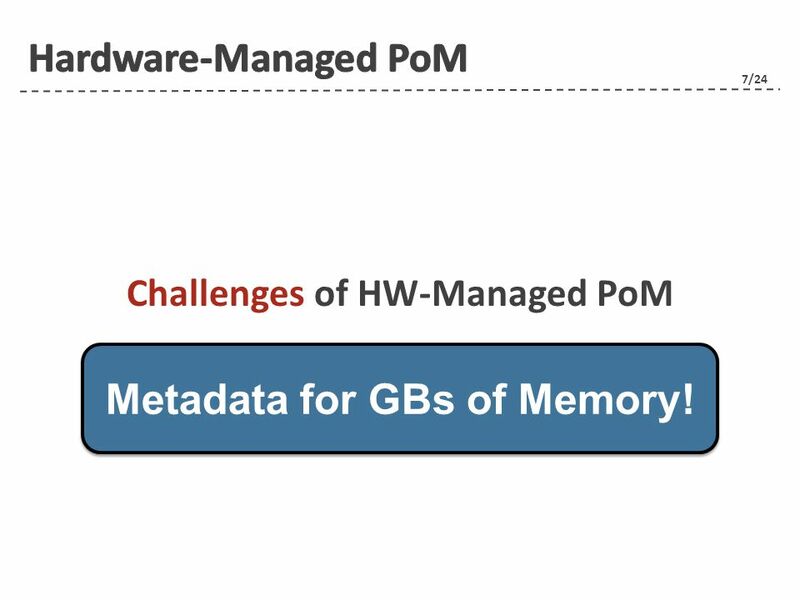 7 7/24 Challenges of HW-Managed PoM Metadata for GBs of Memory! 8 8/24 Requirement? 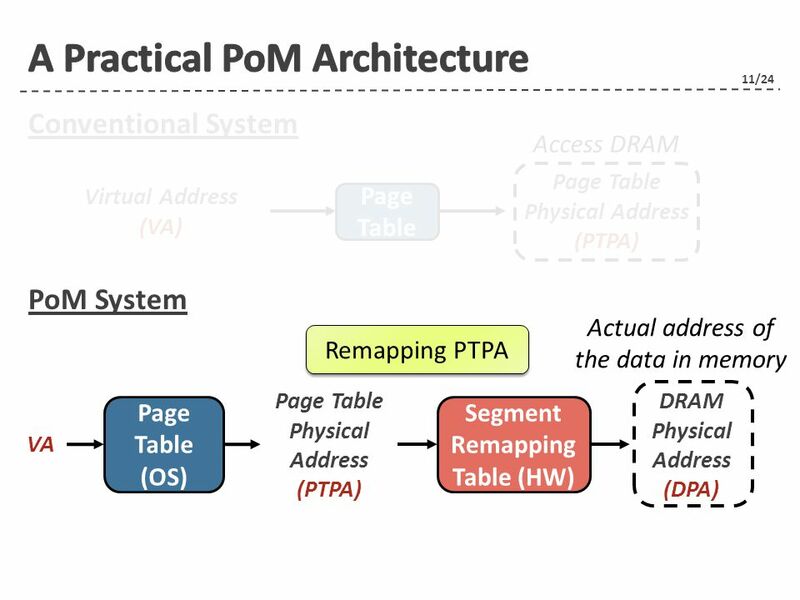 Relocates memory pages in an OS-transparent manner Challenge 1: Maintain the integrity of OS’s view of memory Approach 1: OS page table modification via hardware (unattractive) Approach 2: Additional indirection by remapping table Remapping Table (2GB Stacked DRAM/2KB Segment) Size: tens of MBs Latency: tens of cycles Page Table Physical Address (PTPA) DRAM Physical Address (DPA) PA Remapping Where to architect this? 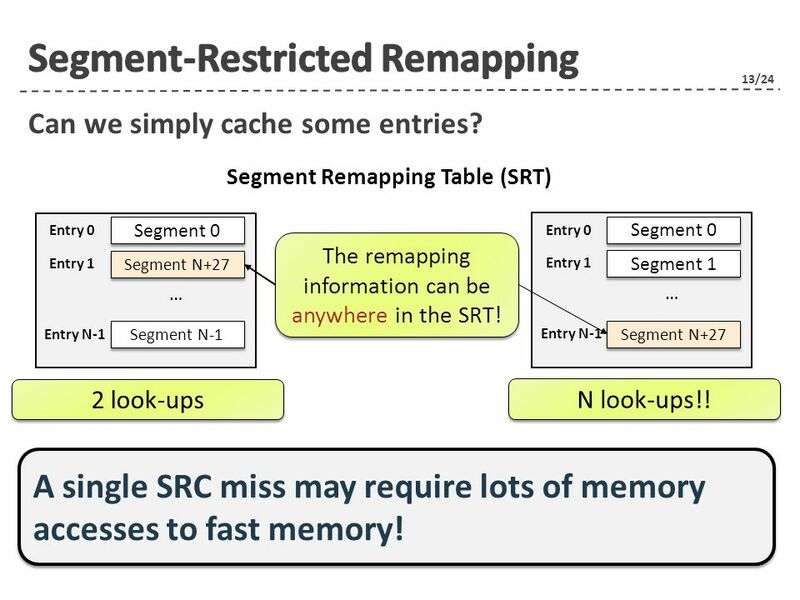  Added to every memory request   Our Approach: Two-Level Indirection with Remapping Cache Remapping granularity! 13 13/24 Can we simply cache some entries? The remapping information can be anywhere in the SRT! 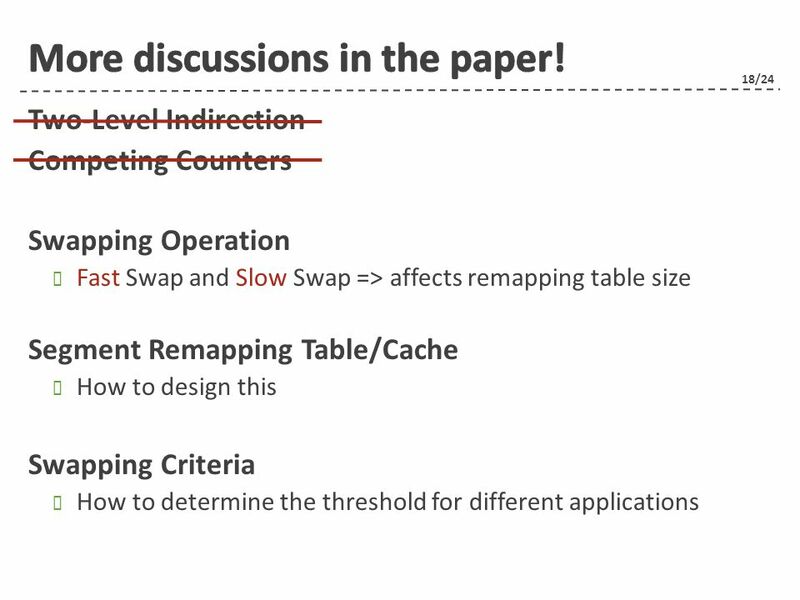 Segment 0 Entry 0 Segment N+27 Entry 1 Entry N-1 Segment N-1 … Segment Remapping Table (SRT) Segment 0 Entry 0 Segment 1 Entry 1 Entry N-1 Segment N+27 … 2 look-ups N look-ups!! 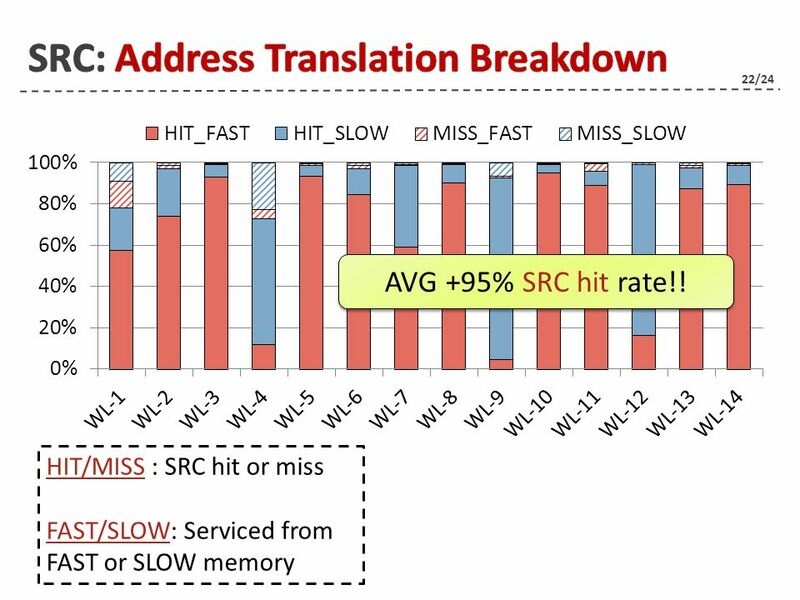 A single SRC miss may require lots of memory accesses to fast memory! 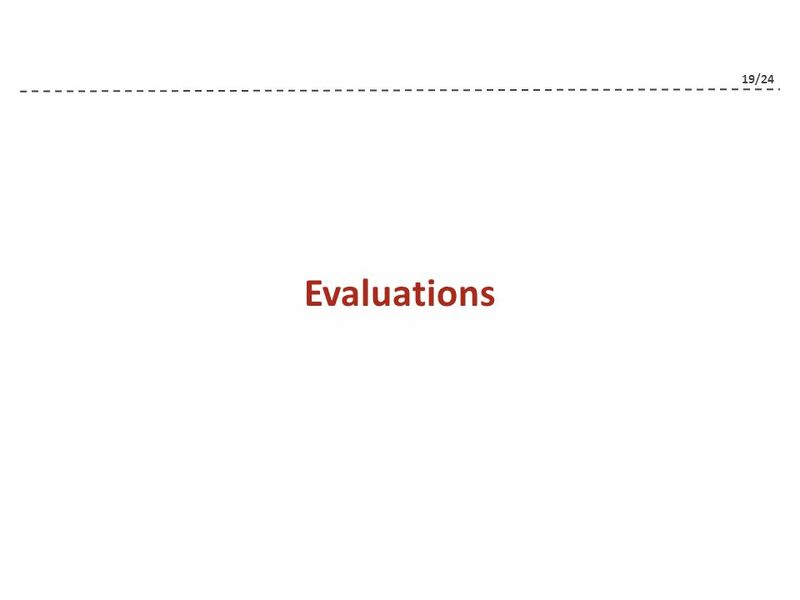 17 17/24 How to compare counter of all involved segments? 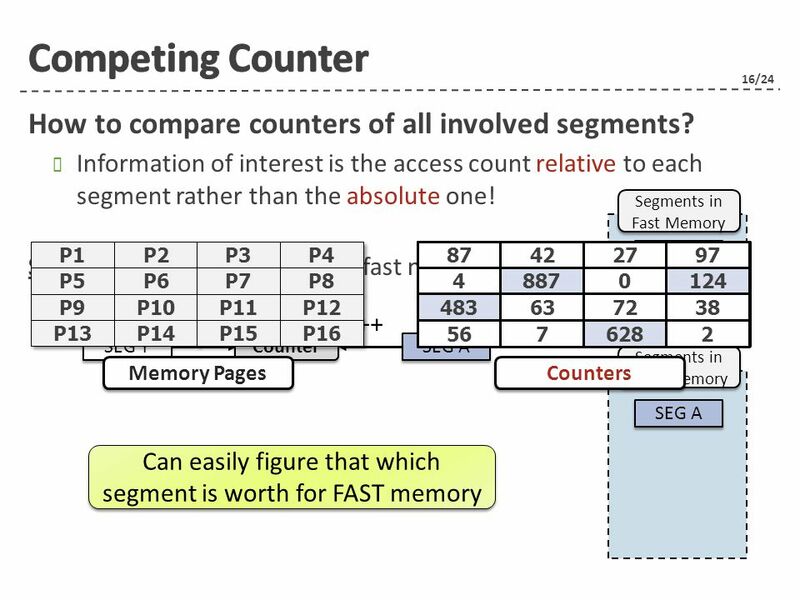 General Case SEG A SEG C SEG B SEG D Segments in Fast Memory Segments in Fast Memory Segments in Slow Memory Segments in Slow Memory SEG Y SEG Z C1 SEG Y SEG A -- ++ C3 SEG Y SEG C -- ++ C2 SEG Z SEG B ++ -- C4 SEG Z SEG D ++-- Segment-Restricted Remapping C1 SEG Y SEG A -- ++ SEG C ++ C2 SEG Z SEG B ++ -- SEG D ++ #Counters is bounded to #segments in slow memory! Sharing Counter Among Competing Segments! Sharing Counter Among Competing Segments! 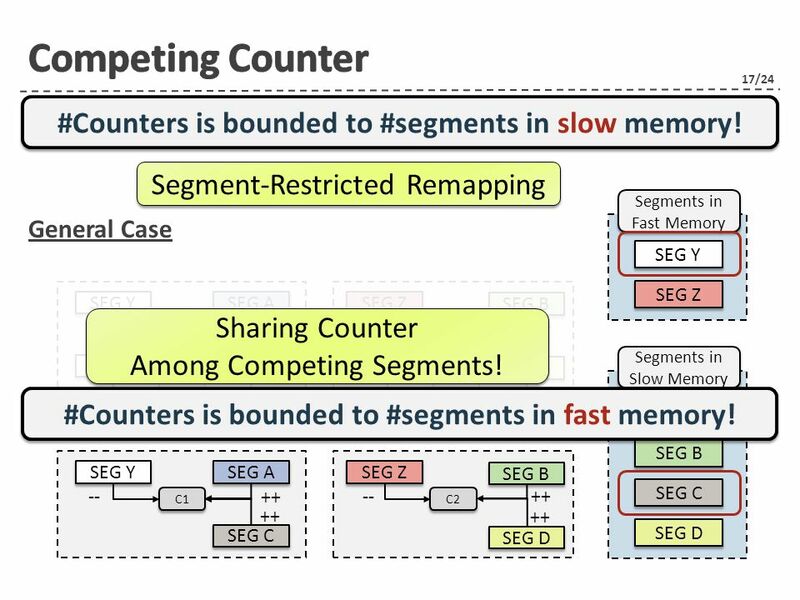 #Counters is bounded to #segments in fast memory! 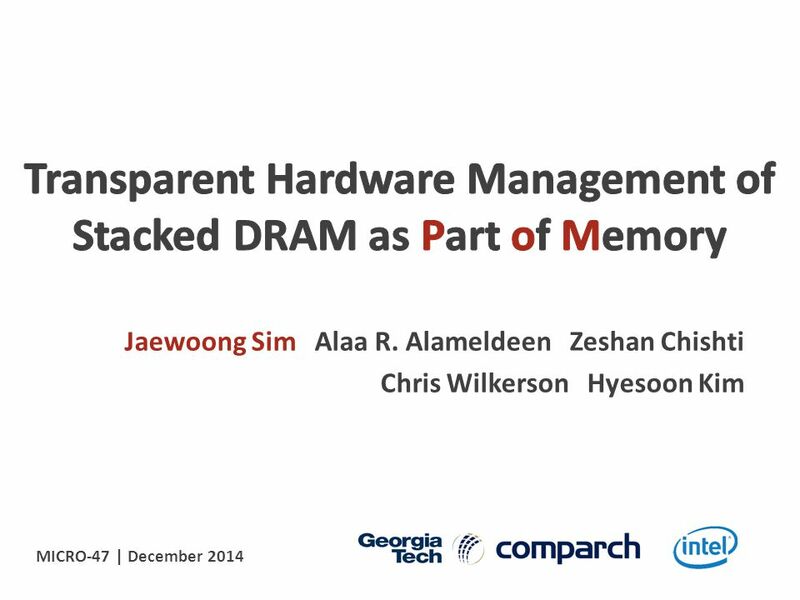 Download ppt "Jaewoong Sim Alaa R. Alameldeen Zeshan Chishti Chris Wilkerson Hyesoon Kim MICRO-47 | December 2014." 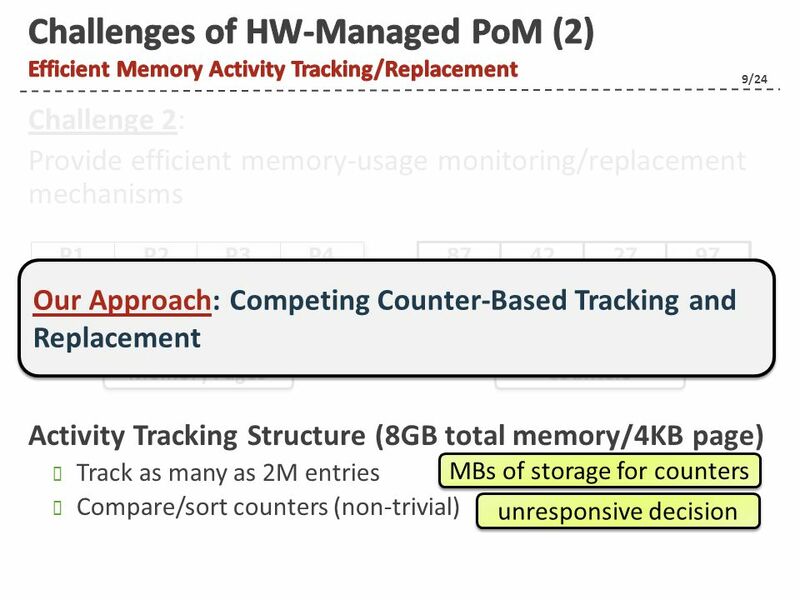 Application-Aware Memory Channel Partitioning † Sai Prashanth Muralidhara § Lavanya Subramanian † † Onur Mutlu † Mahmut Kandemir § ‡ Thomas Moscibroda. 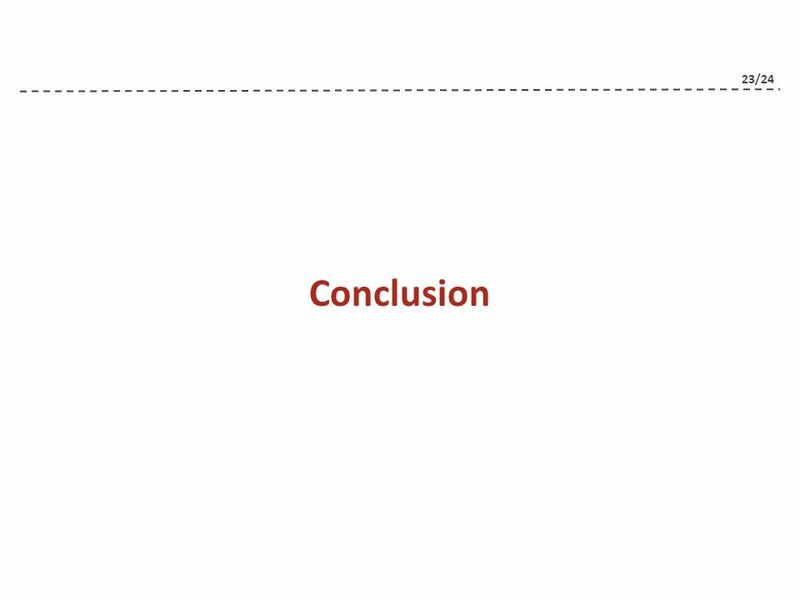 D. Tam, R. Azimi, L. Soares, M. Stumm, University of Toronto Appeared in ASPLOS XIV (2009) Reading Group by Theo 1. 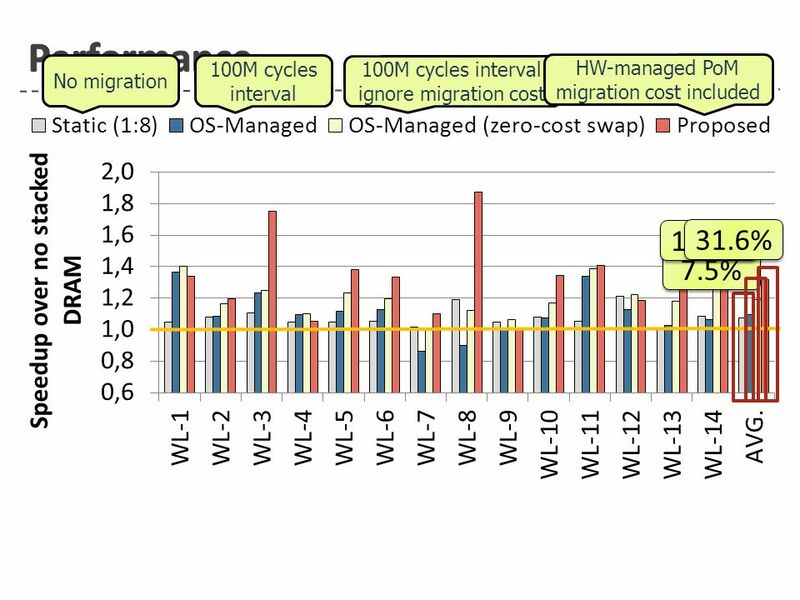 1 Lecture 17: Large Cache Design Papers: Managing Distributed, Shared L2 Caches through OS-Level Page Allocation, Cho and Jin, MICRO’06 Co-Operative Caching. 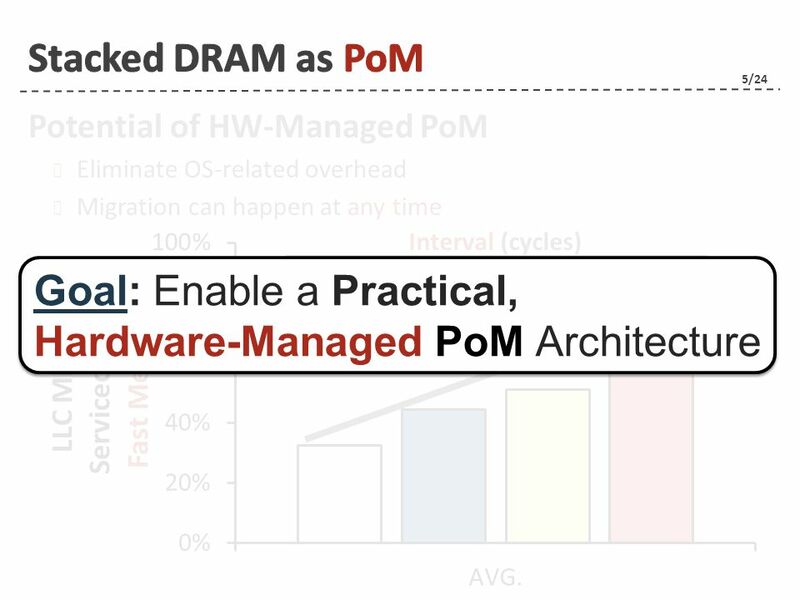 AMD OPTERON ARCHITECTURE Omar Aragon Abdel Salam Sayyad This presentation is missing the references used. 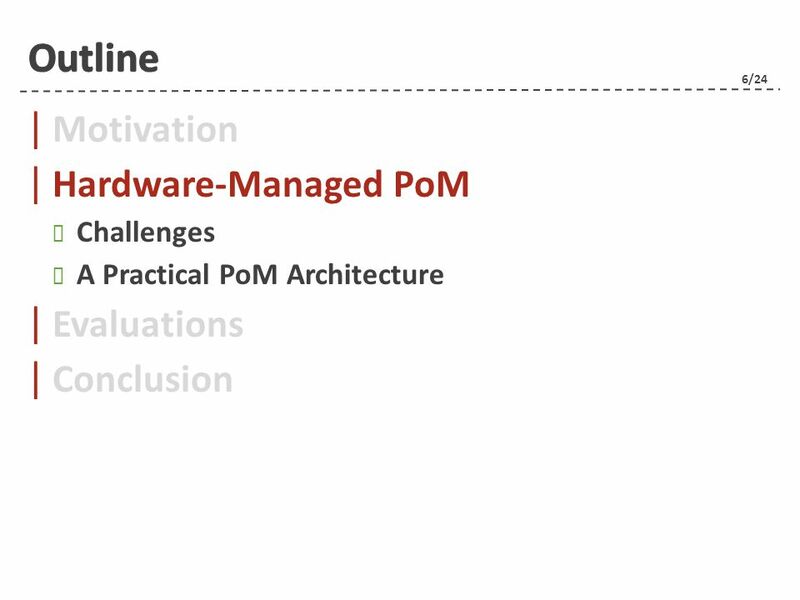 4/17/20151 Improving Memory Bank-Level Parallelism in the Presence of Prefetching Chang Joo Lee Veynu Narasiman Onur Mutlu* Yale N. Patt Electrical and. 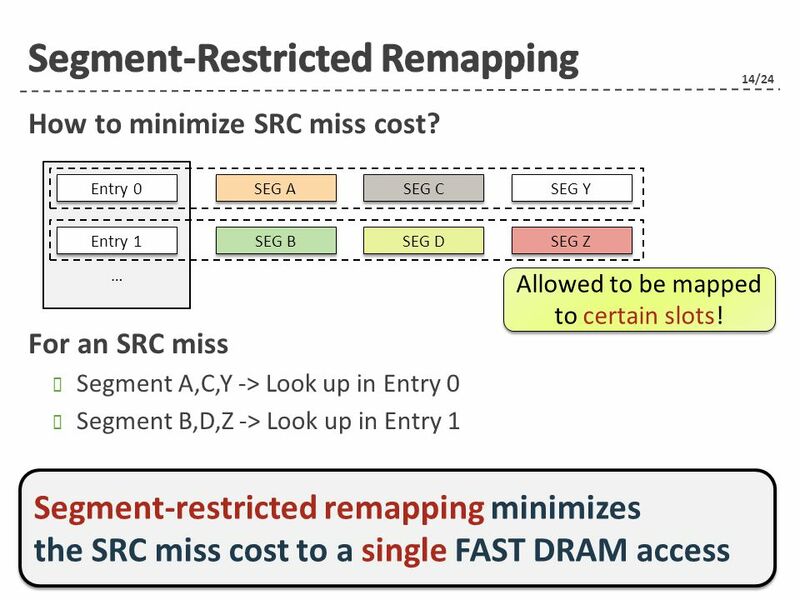 Smart Refresh: An Enhanced Memory Controller Design for Reducing Energy in Conventional and 3D Die-Stacked DRAMs Mrinmoy Ghosh Hsien-Hsin S. Lee School. 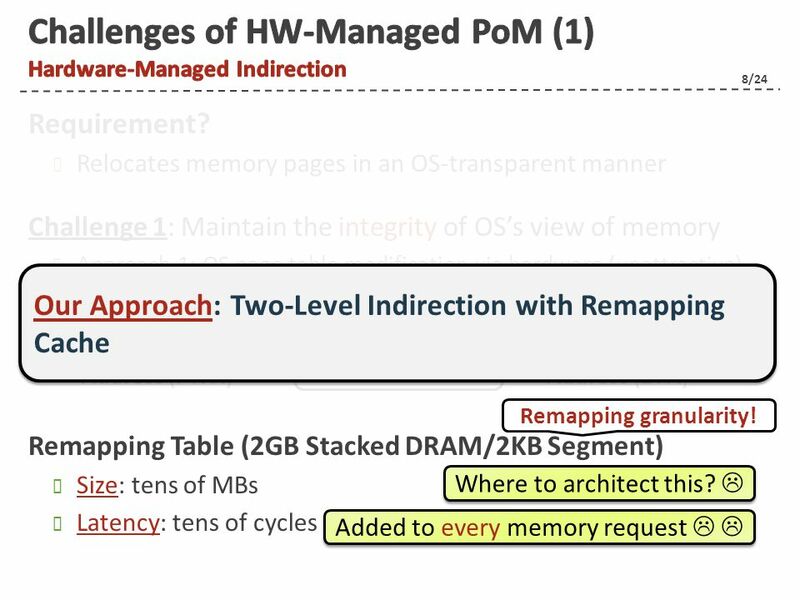 1 Memory Management Managing memory hierarchies. 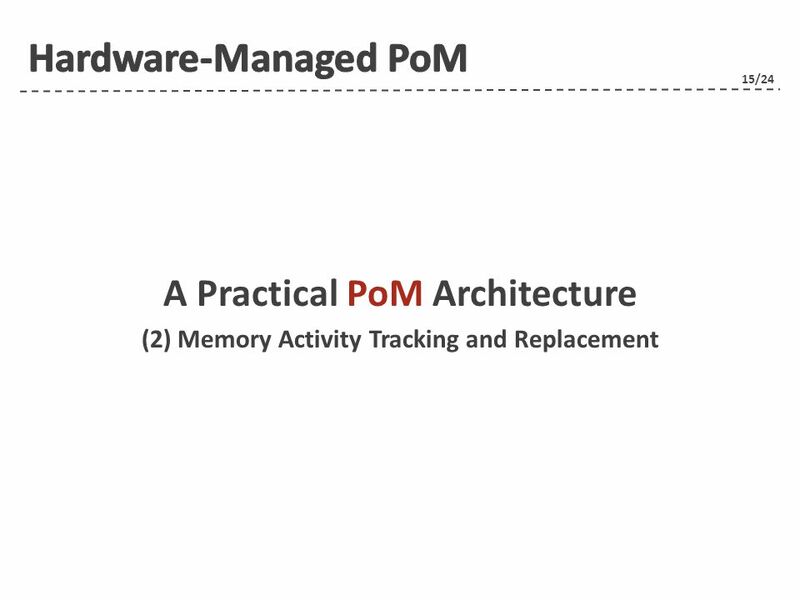 2 Memory Management Ideally programmers want memory that is –large –fast –non volatile –transparent Memory. 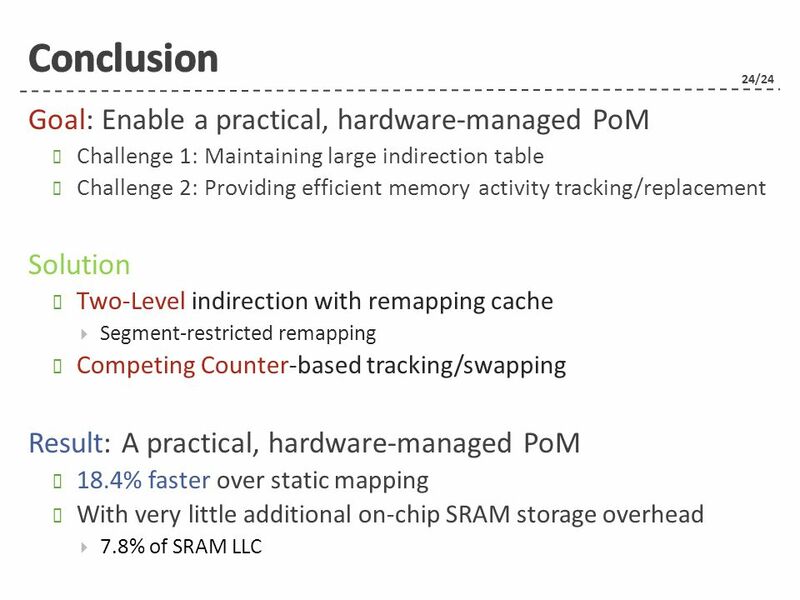 CMSC 611: Advanced Computer Architecture Memory & Virtual Memory Some material adapted from Mohamed Younis, UMBC CMSC 611 Spr 2003 course slides Some material. CSC 4250 Computer Architectures December 8, 2006 Chapter 5. 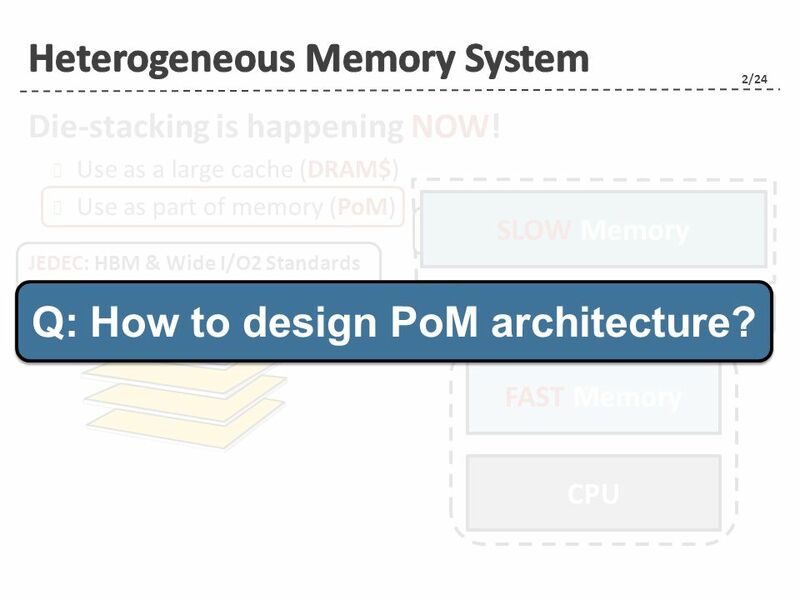 Memory Hierarchy. MICRO-45December 4, 2012 Research Jaewoong Sim Gabriel H. Loh Hyesoon Kim Mike O’Connor Mithuna Thottethodi. 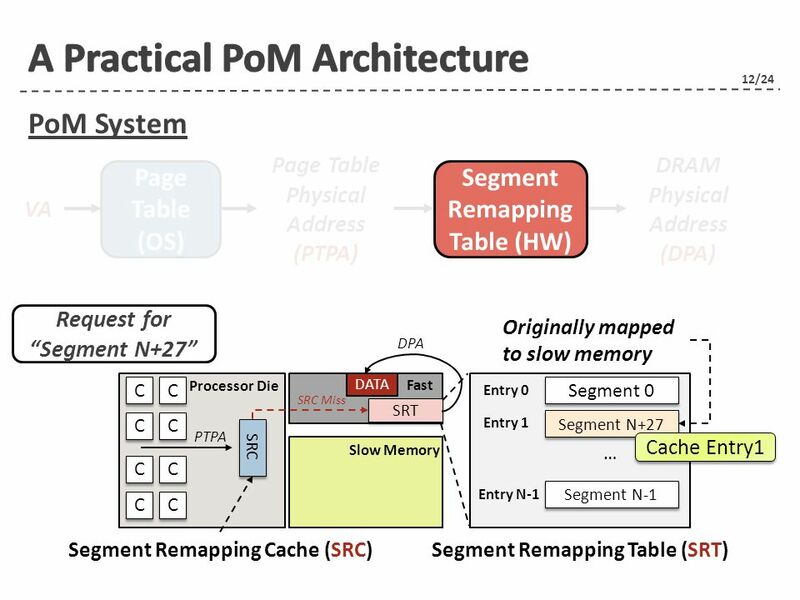 A Cache-Like Memory Organization for 3D memory systems CAMEO 12/15/2014 MICRO Cambridge, UK Chiachen Chou, Georgia Tech Aamer Jaleel, Intel Moinuddin K.
Virtual Memory Adapted from lecture notes of Dr. Patterson and Dr. Kubiatowicz of UC Berkeley. 1 COMP 206: Computer Architecture and Implementation Montek Singh Mon., Nov. 17, 2003 Topic: Virtual Memory. 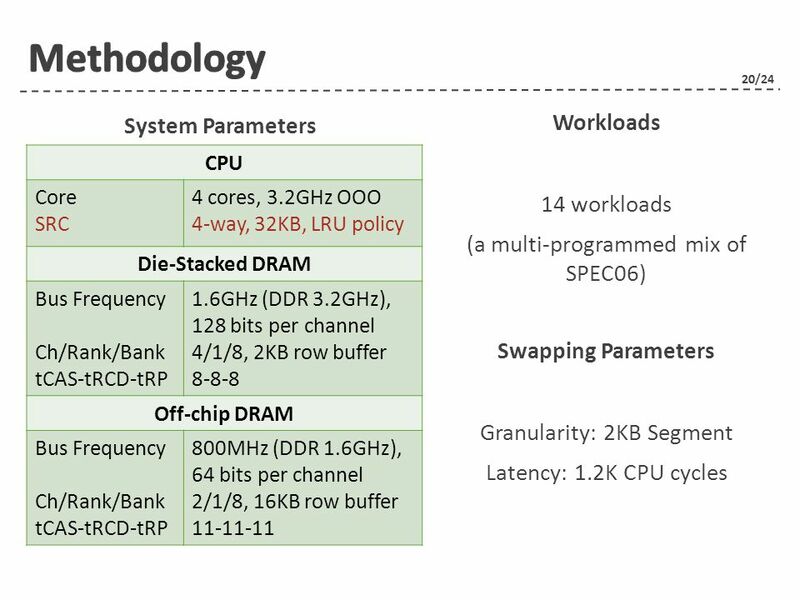 CSCE 212 Chapter 7 Memory Hierarchy Instructor: Jason D. Bakos.